As part of the Leadership Institute of Acadiana’s 2018-2020 Strategic Plan, we have committed to convening, building, and activating leaders that find solutions to some our community’s most pressing challenges. 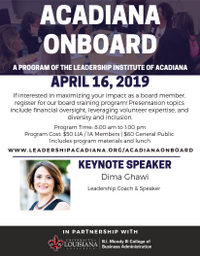 Our newest Program Acadiana OnBoard aims to increase the effectiveness of non-profit board members and to enhance the pool of new leaders in the community in an effort to increase the inclusiveness and diversity on non-profit boards. On Tuesday, April 16, 2019, LIA will host our second Acadiana OnBoard summit. Participants will learn how to maximize their impact as board members through interactive workshops and a dynamic keynote speaker. Participants will have the opportunity to select from 6 workshops, participate in interactive networking activities, and learn key tactics on how to operationalize inclusive board recruitment from our keynote speaker, Dima Ghawi.